The malware was coded in C/C++ programming language with inline Assembly, is written very well, uses several "advanced" encryption schemes (compared to the usual suspects) and the hardcoded IP addresses to the Servers leads, among others, to hosting providers in Panama (see Appendixes for whois information). After viewing the hexadecimal output we open our Resource-Editor and see the only resource is "B" -> "284". The resource's size is 11.776 Bytes and looks like random data. 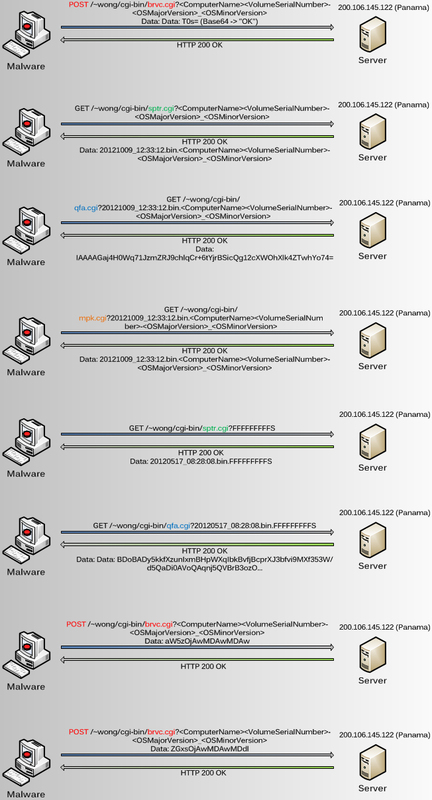 Let's start to do a further analysis and take a look into the code of this malware. We open up IDA Pro, load the .dll and land in the DllMain routine. If we take a look at the "Exports" we see, beside the DllEntryPoint function (which every Dll has, because of the needed Entrypoint), the only exported function is "Start". But before we examine this routine, let's take a quick look at the "Functions". We see a lot of C++ runtime functions, a few Windows API functions and two functions which look like Entrypoints (DllEntrypoint, DllMain). What is the real Entrypoint? A .dll build with a Microsoft C++ compiler and the C/c++ run-time library looks like it has 2 "Entrypoints". The function _DllMainCRTStartup (in IDA Pro named DllEntrypoint) does some internal runtime stuff and calls DllMain (http://msdn.microsoft.com/en-us/library/aa295784%28v=vs.60%29.aspx). So we can skip the DllEntrypoint function and take a look into DllMain (what IDA Pro showed us on beginning). The only interesting operation in DllMain is the storage of the handle to the DLL module in a global variable for later use. Now let's take a look into the Start() function. With the help of LoadLibrary() and GetProcAddress() some of the decrypted API functions then get dynamically resolved. Thereafter the malware gets the OS version (MajorVersion, MinorVersion) and stores it for the installation part. Then the resource section is loaded into memory and decrypted with the same decryption routine as before. Now we can see the resource section is another PE file (the Downloader). There follows the installation of the decrypted PE file. The installation part first looks for the file time of "els.dll" (Windows Event Viewer Snapin) which resides in Windows's system folder (Windows XP SP3) and stores it. If the file "els.dll" isn't found, the malware acquires the system time and converts it to file time format (SystemTimeToFileTime()). Chosing this way, the malware is started by Explorer.exe on Windows startup, because Explorer.exe is the shell for Windows. That's the whole functionality of the Dropper, so let's move on to the Downloader. According to which startup/installation method is used, the Downloader starts in different ways. We can summarize the "Explorer.exe" and "Windows Vista and above" startup routines into one description, because the exported function "Init1" which is called on "Windows Vista and above" startup method just waits for completion of DllMain() function (WaitForSingleObject()). This method decrypts strings, function names and .dll names as we saw in the initial Dropper for subsequent use. 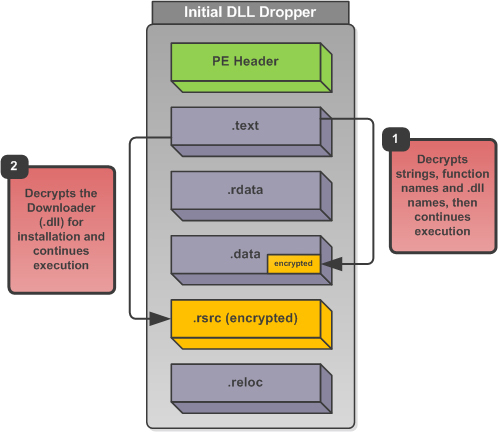 The decryption routine is different than the one used in the initial Dropper. With the decrypted function and .dll names the malware then resolves some API function addresses and uses it to create the main Thread. Starts with the registration of the Service Control Handler (RegisterServiceCtrlHandlerEx()). The Service Control Handler handles SERVICE_CONTROL_STOP, SERVICE_CONTROL_INTERROGATE and SERVICE_CONTROL_SHUTDOWN control codes and sets the appropriate elements of SERVICE_STATUS structure (SetServiceStatus()). Then it also creates the main Thread and executes it. The "brvc.cgi" script/program is used for processing status messages (as we will see also later). If for some reason the sending of the initialization message failed, the main Thread sleeps for 5 minutes and then tries again to send the message. As you can see, the message is send with HTTP POST request method and is Base64 encrypted with the help of CryptBinaryToString() function. For network communication the Downloader uses the "Common Gateway Interface" (https://en.wikipedia.org/wiki/Common_Gateway_Interface). With the Common Gateway Interface a client (normally a browser, in our case the malware) can send data as part of the HTTP request (POST/GET method) that gets processed on the Server with help of a program/script. This program/script is executed on the Server by the HTTP daemon (httpd) and can be coded in any language (C, Perl, Python, ...) as long as it is able read from the standard input, write to the standard output and has access to environment variables. That's all the functionality of the main Thread, let's continue with the sub-Thread. At first it checks if a network conection is available (InternetGetConnectedState()). If this is the case it connects to the Server 200.106.145.122 (InternetOpen() + InternetConnect()) with User-Agent "MSIE 8.0". The "qfa.cgi" script/program processes all file queries (I guess "qfa" means "query file available") and sends a HTTP 200 OK response with Base64 encoded and encrypted data. The data then gets decrypted in memory and used for the subsequent HTTP requests. I think the first HTTP request to "qfa.cgi" is used to get the Server and folder where the file to be downloaded can be found. During the static analysis I haven't completely understood the decryption scheme (RC5/6 + Custom) by just reading the disassembly (I'm not a crypto guy). I tried to debug and patch the Downloader to feed the appropriate decryption functions with the catched data, but it isn't a trivial task to do that with a multithreaded dll in OllyDbg (1.10). For example I encountered a strange problem by stepping over one of the Windows API functions used by the malware (see http://www.kernelmode.info/forum/viewtopic.php?f=13&t=1915). Fortunately the new OllyDbg (2.01) has some improvements in debugging multithreaded applications. So I finally was able to at least see the decrypted data in memory without understanding the decryption code. After the file is decrypted, the installation procedure begins by comparing the sended string "FFFFFFFFFS" with the hardcoded string "FFFFFFFFFX". If they match, the downloaded and decrypted file is executed in memory without touching the disk. This is done by changing the file's access protection attributes of committed pages in virtual address space to PAGE_EXECUTE_READWRITE (VirtualProtect()) so the it can be executed as a new Thread (CreateThread()). If they don't match, the file is written to disk as "msmvs.exe" (CreateFile() + WriteFile()), executed (CreateProcess()) and finally deleted (DeleteFile()). The installation directory is either the Windows temporary folder (GetTempPath()), if that fails the file is written into the Windows folder (GetWindowsDirectory()). Thereafter the malware tries to load a .dll that is to be dropped by the downloaded file (msmvs.exe) with help of LoadLibrary() function. The string "ins:00000000" tells the malware guy(s) that the execution/installation of the downloaded file was successful without any errors. The string "dll:0000007e" tells him that the dropped .dll from the downloaded file (msmvs.exe) wasn't loaded successfully (GetLastError() -> 0x0000007e). In my case the .dll wasn't loaded because it wasn't there at time of debugging. That's it. 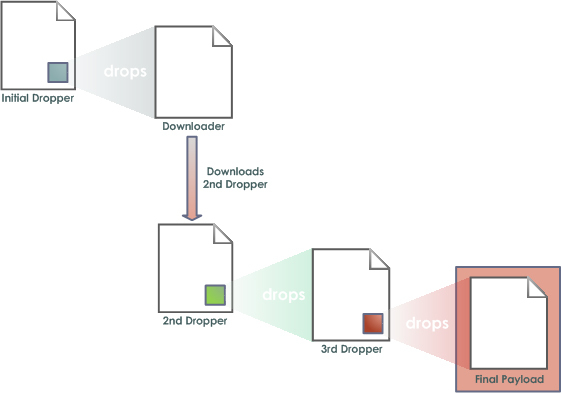 We have analyzed the functionality of the initial Dropper and the Downloader. In the next Part we examine the downloaded file (another Dropper) and the dropped file (yet another Dropper).